• 25/15 ppm in colour and black & white. • Paper formats: A6-SRA3, custom formats and banner format up to 1.2 metres lengt. • 9-inch colour touch panel with multi-touch support and dedicated mobile touch area for more convenience and flexibility in today's working style. • Reduced environmental impact thanks to state-of-the-art technology ensuring competitively low energy consumption  which saves both energy and money. • Highest data security thanks to various security functionalities to reduce the risk of data loss and keep confidential data safe. - You can automatically search for and print to bizhub devices on the same network as your iPhone or other device. - Data can be sent via a wireless LAN to AirPrint-compatible bizhub devices for printing of files such as e-mails, photos and web pages. 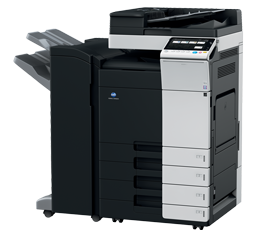 - You can set the number of copies to be printed and single- or double-sided printing. The Mopria Print Service is an application which lets you print directly from devices running Android 4.4 (KitKat) or later. - Documents such as photographs, web pages and PFD files can be printed easily via a wireless LAN to Mopria-certified output devices. - You can search automatically for different MFPs on the same network. 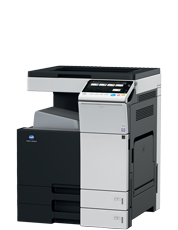 - You can print documents such as e-mails, photos and web pages from MFPs which are compatible with the Mopria Print Service via a wireless LAN. - You can set the number of prints and also change colour and b/w settings. - For environments without Wireless Network, compatible Konica Minolta MFPs now have the capability to deliver their own Wireless LAN, thanks to the Wireless LAN Access Point Mode, without the need for a third party access point (router). - To be an interface user look for a WiFi network and select the bizhub network. Once connected, you are ready to print to this bizhub system. - It may be necessary to update the device firmware. - Up to five units can be connected at one time. - Google Cloud Print is a printing service provided by Google which connects your Konica Minolta printer or MFP to the web via smartphones, tablets, Chromebook, PC or any other web-connected device in use for your application. - Print from a wide range of devices, such as smartphones and tablet devices with iOS or Android. - OS, and also Windows and Mac PCs; no extra printer drivers needed. - Send print jobs to your office printer via the Cloud even while you're out of the office. - Emperon print controller - Konica Minolta's high-performance controller with support of PostScript3, PCL6, PCL 5e/c and XPS. - Direct print - driverless printing of PDF, XPS, DOCx, XLSx, PPTx, JPEG, TIFF, PS and PCL. - Carbon copy print - single page printing from multiple trays with different design. - Banner printing - Print of 1.2 m long banners. 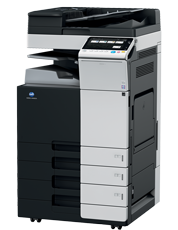 - Mobile Printing - Possibility to directly print documents from a mobile device. - Job preview - illustrates selected copy functions on screen. - Custom function bar - up to 2 x 7 copy functions can be freely selected for the main copy screen. - Blank page removal - automatic deletion of blank pages e.g. when copying mixed simplex and duplex documents. - High-performance document feeder - fast scanning of originals with duplex document feeder. - Mixed original scanning - automatic scanning of originals with different formats. - Scan to Me/Home - direct scan to own email address (Me) or SMB folder (Home) based on Active Directory information. - Scan preview - provides a realtime preview of scanned originals for checking before sending. - Scan annotation - stamping of e.g. date/time, filing number or custom text on scans for archiving purposes. - Scan programs - presetting of original, scan file and destination for regular scan jobs. - Blank page removal - automatic deletion of blank pages e.g. when scanning mixed simplex and duplex documents. - Addressbook - MFP and network based address books can be used and searched. 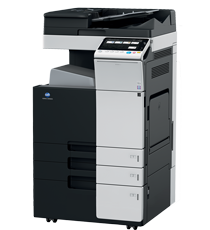 - IP Fax - sending of fax messages via network between Konica Minolta MFPs; supports colour and b/w. 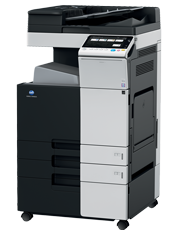 - PC Fax - direct fax transmission from the PC. - Fax forward - forwarding of incoming fax documents by email or to SMB folder instead of printing. - Shared address book - the MFP internal address book can be shared to the PC fax client. - Convenient fax distribution - Fax destinations can be preconfigured in an adressbook. - Network security - Support for SSL/TLS, HTTPS, 802.1x and IPsec. - ECO meter - counter for eco related items e.g. power consumption.  Paper Feed Cabinet PC-110 - Allows you to load up to 500 sheets in the top tray and use the bottom tray as a storage box.  Paper Feed Cabinet PC-210 - Allows you to load up to 500 sheets respectively in the top and bottom trays.  Paper Feed Cabinet PC-410 - Allows you to load up to 2,500 sheets A4 size. 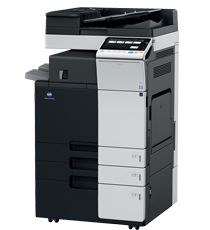  Large Capacity Unit LU-302 - housing A4 format (3,000) sheets, brings maximum paper supply to 6,650 sheets.  Banner Tray BT-C1e - Used to print data on banner paper (max. 297 x 1200 mm). 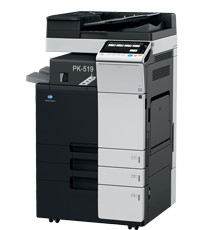  Desk DK-510 - Used to install this machine on the floor and storing consumables and paper.  Finisher FS-533 - Install this unit onto the output tray of this machine. Sorts, groups and staples printed paper before outputting it.  Finisher FS-534 - Sorts, groups and staples printed paper before outputting it. To install Finisher FS-534, Desk DK-510, Paper Feed Cabinet PC-410, Paper Feed Cabinet PC-110, or Paper Feed Cabinet PC-210 must be installed onto this machine.  Finisher FS-534SD - Sorts, groups, staples and fold/bind function. To install Finisher FS-534SD, Desk DK-510, Paper Feed Cabinet PC-410, Paper Feed Cabinet PC-110, or Paper Feed Cabinet PC-210 must be installed onto this machine.  Job Separator JS-506 - Install this unit onto the output tray of this machine. This unit sorts printed sheets.  Punch Kit PK-519 - Install this unit onto Finisher FS-533. This unit supports the punching function.  Punch Kit PK-520 - Install this unit onto Finisher FS-534. This unit supports the punching function.  Working Table WT-506 - Provides an area to temporarily place an original or other materials. This is also used when the Authentication Unit is installed.  Authentication Unit AU-102 - Performs user authentication by scanning vein patterns in the finger. The Working Table WT-506 is required to install Authentication Unit AU-102.  Keyboard Holder KH-102 - Install this holder to use a external keyboard. For details on external keyboards, contact your service representative.  Fax Kit FK-514 - Used to operate this machine as a fax machine. Alternatively, this kit allows more telephone lines to be connected.  Stamp Unit SP-501 - Stamps a scanned original when sending a fax. This unit allows you to check that the original has been scanned.  Spare TX Marker Stamp 2 - A replacement stamp for the Stamp Unit SP-501.  Image Controller IC-416 - Installing this unit will provide higher quality printing result. Video Interface Kit VI-508 and UK-211 (2GB RAM) are required to install Image Controller IC-416. Also, Desk DK-510, Paper Feed Cabinet PC-410, Paper Feed Cabinet PC-110, or Paper Feed Cabinet PC-210 must be installed onto this machine.  Video Interface Kit VI-508 - This unit is required to install Image Controller IC-416.  Local Interface Kit EK-608 - Install this unit when using the external keyboard or voice guidance. This unit is equipped with a speaker.  Local Interface Kit EK-608 - Install this unit when connecting to the external keyboard or Bluetooth-enabled device. This unit is equipped with a speaker, voice guidance and a receiving device for Bluetooth communication.  Upgrade Kit UK-211 - Install this unit when using PDF processing, searchable PDF, My Panel, My Address, or special fonts.  i-Option License LK-102v3 - Supports the PDF processing function that is one of the advanced functions.  i-Option License LK-105v4 - Supports the searchable PDF function that is one of the advanced functions.  i-Option License LK-106 - Used to add a bar code font that is one of special fonts.  i-Option License LK-107 - Used to add a unicode font that is one of special fonts.  i-Option License LK-108 - Used to add an OCR font that is one of special fonts.  i-Option License LK-110v2 - Generation of file formats: DOCX, XLSX & PDF/A.  i-Option License LK-111 - ThinPrint Client Function. Print data compression for reduced network impact.  i-Option License Kit LK-115v2 - Trusted Platform Module (TMP) for protection of data encryption and decryption.  Security Kit SC-508 - Supports the copy guard and password copy functions to prevent unauthorized copying (2 licenses SC-508 required).  SX-BR-4600 Wireless LAN - External LAN to Wi-fi BOX.  Unități de developare: C/M/Y/K 600.000 pagini. First page out monochrome < 6,1 sec. First page out color < 7,5 sec. Formate utilizator: Lățime (90 ~ 320mm) x Lungime (148 ~ 1.200 mm). Formate utilizator: Lățime (148 ~ 297 mm) x Lungime (210 ~ 420 mm). Formate utilizator: Lățime (148 ~ 320 mm) x Lungime (210 ~ 450 mm). ◦ Casetă externă de mare capacitate: 3.000 file A4, 52 - 256 g/m². ◦ Copiere față-verso: 110 imagini/min., 600 dpi, mono/colour. Notă: pentru copiere automată față-verso, se instalează RADF DF-629 sau DSDF DF-704. ◦ FS-534SD Finisor de broșurare: sortează, grupează, sortează/grupează prin deplasare, capsează 50 file, pliază, broșurează 20 de file și stochează 2.300 file. ◦ USB host (direct print). ◦ UK-212 Wireless LAN / Punct de Acces (solicită EK-608 sau EK-609). maxim 4 GB + modulul UK-211 (2GB RAM) pentru: Upgrade Licenţe i-Option, Cloud Print, Overlay (copiere), 5 funcții speciale de imprimare, 7 funcții speciale scanare. Opțional: ◙ Overlay, necesar UK-211 (2GB RAM). ◦ 1.200 x 1.200 dpi. ◦ 137 x PostScript 3 Emulation Latin. Opțional: ◙ Date stamp; ◙ Overlay; ◙ Page stamp; ◙ Stamp; ◙ Watermark. Notă - pentru toate funcțiile opționale este necesar un UpGrade de memorie RAM de 2 Giga Bytes (opțiunea UK-211). ◦ Scanare față-verso: 160 imagini/min., 300 dpi, mono/colour. ◦ 2100 (single + group). Opţional: Searchable PDF/A 1a & 1b, Searchable PDF,Searchable PPTX, Outline PDF, Encrypted PDF and PDF/A (solicită UK-211). ◦ Până la 400 programe. ◦ Scala Color/Gri: TIFF (RFC3949 Profile-C). ◦ Windows Server 2012 R2. TCP/IP (IPv4/IPv6), BOOTP, ARP, ICMP, DHCP, DHCPv6, AutoIP, SLP, SNMP, FTP, LPR/LPD, RAW Socket, SMB over TCP/IP, IPP, HTTP, POP, SMTP, LDAP, NTP, SSL, IPX, AppleTalk, Bonjour, NetBEUI, WebDAV, DPWS, S/MIME, IPsec, DNS, Dynamic DNS, LLMNR, LLTD, SSDP, SOAP. *When using the Lotus Domino Server, and setting the search condition to OR, the function will not work correctly. ◦ Autentificare biometrica (scanarea dispunerii venelor în deget) / Biometric Login.